Flags are never a random assortment of colours, patterns, and symbols. Although some flags are prettier than others, the colours and patterns are never chosen simply because they look nice. Everything has meaning and significance. The Portuguese flag is no different. Red and green wasn’t chosen simply because the committee that designed the flag liked those colours. They were chosen because of their significance to Portugal’s past and future. Back in 1911, one year after the Portuguese monarchy fell and Portugal became a republic, a special team was formed to design a flag that symbolised the new Portugal. Members of this committee included painter Columbano Bordalo Pinheiro, journalist João Chagas, and writer Abel Botelho. After a lot of head-banging and discussions they presented the design for the flag that we’re all familiar with today, but it wasn’t initially widely accepted. In fact, it was seen as controversial. The committee would have to explain each of their choices, and why they were important for this new flag. 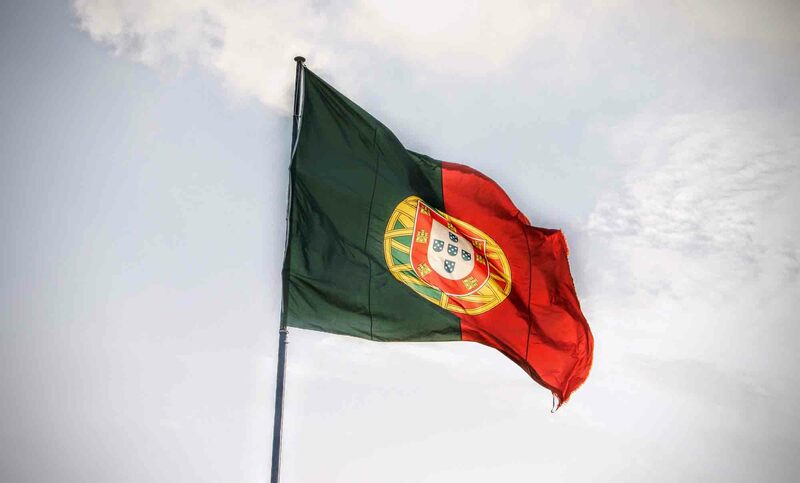 The first thing that most people notice about the Portuguese flag is the colours: green and red. According to the flag-designing committee, red symbolised all of the blood lost by people fighting for Portugal to become a republic and green symbolised hope for the future. As idealistic as that explanation was, it wasn’t enough to win over everybody. A lot of people liked the old white and blue flag, despite its associations with the monarchy. Aside from familiarity, blue was also associated with Our Lady of the Conception who was crowned Queen and Patroness of Portugal by King John IV. Portugal is still a religious country even to this day, and so removing any religious symbolism was going to be a difficult task. There was another, maybe even bigger, reason that many people were opposed to the new colours and that was because the red and green were the colours of the Portuguese Republican Party. Portugal was becoming a republic, yes, but that didn’t mean that the Portuguese Republican Party should get any free advertising. Despite these concerns, the flag’s design was accepted. Interestingly, the flag isn’t evenly split: there’s a lot more red (blood) than green (hope) which is very typical of the Portuguese outlook. It isn’t immediately obvious what the shape in the middle of the Portuguese flag is, but it’s actually two things: a yellow armillary sphere (the yellow ribbon-looking design) and a shield. The armillary sphere (also known as a spherical astrolabe, armilla, or armil) is an astronomical device that was used to navigate the oceans during the Age of Discoveries or Age of Exploration. The Portuguese sailors weren’t the first to use this device: the Knights Templar used it before them. Henry the Navigator, one of the most famous people from the Age of Discoveries, was actually the Grand Master of the Order of Christ and it’s likely that he introduced it. The Age of Discoveries was Portugal’s golden era, a time when they were prosperous and forward-looking, and the flag’s designers felt it was important to have some reminder of this period within the flag. In the centre of the flag there’s a red shield, which sits on top of the yellow armillary sphere. This shield has been part of pretty much every previous version of the Portuguese flag, with the exception of the flag under the reign of Afonso I. The shield isn’t completely red, of course. There’s quite a lot going on. There are 7 yellow castles on top of the red section, and a white interior with 5 smaller blue shields. On each of the blue shields, there are 5 white dots. The shield itself represents past Portuguese victories. The 7 castles is believed to represent the 7 castles that the Portuguese took back from the Moors, although this is only speculation. The 5 smaller blue shields represent the 5 Moorish kings who were killed by the first King of Portugal, Afonso I. These kings ruled the Seville, Badajoz, Elvas, Évora, and Beja tarifas during the Moorish period. The 5 white dots within each blue shield represent the 5 wounds of Christ. And that’s the Portuguese flag in a nutshell. What do you think of the Portuguese flag? Do you like it? Do you like what it represents? Share your thoughts, reviews, and theories by leaving a comment below. Would love to get a flag .How do I get to buy one. My Kids are Soo Proud of their heritage. Uh-uh. It’s an ASTRONOMICAL device. Astrological devices are used by fortune-tellers, as aides to extract money from the gullible. What fascinating history each country’s flag has, don’t you think? Definitely! I never realised that each one had a story.